This eBook was produced by Roy Glashan from a donated text. Charles Scribner's Sons, London, 1928. IT is a natural thing for the humanitarian to say, of any man convicted of wilful murder, that he could not have been sane when he performed the act; and when murder is done in such circumstances and in such an atmosphere as that which marked the destruction of Emily Beilby Kaye, more profoundly does the mind of a balanced man grow bewildered. 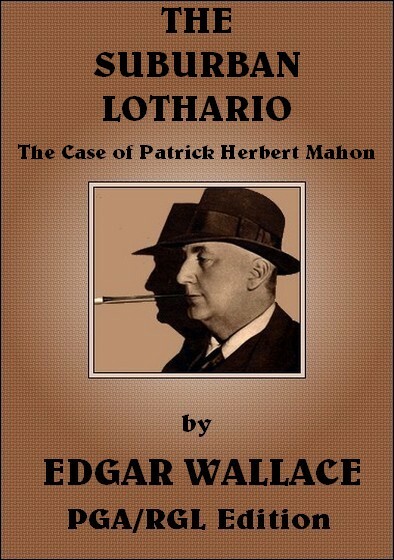 Yet all things were possible with Patrick Herbert Mahon, whose form of insanity took the shape of a colossal vanity. Mahon was a man of pleasing address, popular with women and with his fellow men. For all his anti-social acts, he was in the way of being a social success in certain circumstances in those circles to which he had the entrée. He was born in Liverpool; one of a large family of struggling middle-class folk—a boy of some small talent and an assiduous attendant at Sunday school. So he became an office boy, ultimately a junior clerk. He continued to go regularly to church and took a vivid interest in its social affairs. He displayed some prowess in athletics and was particularly fond of football, becoming indeed a prominent member of one of the local church teams. His early mode of life is described as having been a model for all young men. At school he first met the pretty, dark-haired girl to whom his life was to become so tragically linked. She was two years younger than he, and their school friendship developed into something warmer at a later stage. Indeed, they were both in their teens when he first proposed marriage. There was strong opposition by both families and it was two years after this—in 1910—that they were married. He was then twenty and the girl eighteen. Perhaps it was a reckless marriage. But this at least should be said. If any woman could have deflected Mahon from the path that was to lead to the scaffold, it was Mrs. Mahon. With singular devotion she held to him through the black and anxious years to the end. Hers is the real tragedy of this story. Within a year of their marriage he had forged and uttered cheques for £123 on the firm which employed him. With this money he took a girl to the Isle of Man. He was traced, brought back, and bound over. Mrs. Mahon forgave him and they left Liverpool to start life anew. Ultimately he obtained a position with a dairy firm in Wiltshire. There is no doubt that he had a fund of business ability, and this, with an apparent genial vivacity of manner, served him well for a time. He was still a ‘sportsman’, and played football for a local team. About this time a little girl was born. Hard upon this Mahon was arrested for embezzling £60 from his employers and was sentenced at Dorchester Assizes to twelve months’ imprisonment. Upon his release he is known to have lived for a while in the neighbourhood of Caine, Wiltshire. There was a mysterious epidemic of burglaries in this neighbourhood, and it may or may not have been a coincidence that Mahon suddenly decided to seek other quarters. He is next heard of at Sunningdale, where he was employed by a dairy. This time there were some love affairs which provoked a little scandal. Again Mahon was thrown out of work. There is a gap here which the imagination may easily fill in. Mahon had become interested in racing, and, when opportunity offered, attended race meetings in many capacities—preferably as a bookmaker’s clerk. However that may be, it fell on a day in the early part of 1916 that a branch of the National Provincial Bank at Sunningdale was entered at night. A maid-servant who interrupted the intruder was ferociously attacked with a hammer. When she regained consciousness she found herself in the arms of Mahon, who was kissing her. Later Mahon, who had dodged to Wallasey, was arrested and tried at Guildford Assizes for the offence. It was brought plainly home, and after he had been found guilty he made a whining appeal to the judge to be allowed to join the Army. Lord Darling sternly retorted that he was a thorough- paced hypocrite whom the Army could do without, and sentenced him to five years’ penal servitude. That term he served. A boy was born in 1916, but died a year or two later without having seen his father. Mrs. Mahon, left to her own resources, with indomitable courage sought a living for her little girl and herself. She obtained a post with Consols Automatic Aerators Ltd., which had a factory at Sunbury. Her efficiency and energy soon attracted the attention of the heads of the firm, and she was promoted to a responsible position. They settled down in a flat in Pagoda Avenue, Richmond, and Mrs. Mahon used her influence to procure him a berth as a soda-fountain salesman with her firm. Mahon did well—so well that when in May, 1922, the business was put in the hands of a Receiver he was appointed sales manager. Now it chanced that the Receiver of the Company, a member of a firm of chartered accountants, in the beginning of 1923 engaged as a typist a woman— she can scarcely be described as a girl, since she was then thirty-seven years old, Miss Emily Beilby Kaye. Miss Kaye had maintained herself by her own efforts for many years. She was a competent, experienced woman, not uncomely, who lived at a bachelor girls’ club, and had managed to put by a sum of money, considerable for one in her position. She was not in the least averse from a flirtation with the handsome sales manager, this suburban Lothario, with whom business circumstances now brought her in contact. This was the immediate prologue to the tragedy. Miss Kaye was not as some of the other women Mahon had made his playthings. She could not be easily thrown aside. Apart from this episode, Mahon felt the ground solid beneath his feet. His income was more considerable than it had ever been and, added to that of his wife, allowed a very comfortable existence. He was happy in his work; he was popular among his social acquaintances in Richmond and the neighbourhood. He had become secretary of a local bowling club. Save to his wife, his past was utterly unknown. The future looked full of promise. All this would have to be jettisoned, his career, his friends, his home—and he had a sort of attachment to his wife and little girl—if he yielded to Miss Kaye and took to flight with her. He fought weakly to save himself. Even so, he might have succeeded, had not fate put into the hands of Emily Kaye somewhere about this time a weapon against which he felt impotent. It was the first of a number of strange coincidences with which the case was marked. No reference was made to it at the trial, nor did it leak out in the newspapers. EMILY KAYE was clearing a drawer of some of her belongings. At the bottom of the drawer someone had placed a sheet of newspaper. And as she took it out her eye lighted casually on the name of Patrick Mahon. Thus she read of his trial at Guildford Assizes. It may be assumed that she used this knowledge in her interviews with Mahon. She pressed the idea of ‘a love experiment’, and he gave way. He engaged a bungalow on the stretch of lonely beach between Eastbourne and Pevensey Bay for two months, using the assumed name of Waller. This bungalow, known indifferently as ‘Officer’s House’ and ‘Langney Bungalow’, had formerly been the official residence of the officer in command of a coastguard station. This was at the beginning of April, 1924. Miss Kaye received the news with some coldness. She had not intended the ‘experiment’ to last longer than a few days. However, she sold out her remaining shares, and went down to stay at Eastbourne by herself while she looked over the place. Mahon was to join her later. Yet the ruling passion was still strong in him. Two days before he was to take possession of the bungalow with Miss Kaye he met Miss Duncan—a stranger— in the street at Richmond, and although it was a wet night walked with her most of the way to her home at Richmond. He remarked that his married life was a tragedy, and invited her to dine with him on the following Wednesday. The episode gives a clue to the psychology of the man. Murder must have been very close to his mind at that time, and yet he could philander with still another woman. On April 12 he purchased a saw and knife at a shop in Victoria Street, and travelling down to Eastbourne met Miss Kaye at the station. They took a cab to the bungalow, and so the ‘love experiment’ started. So far as his home and his firm was concerned Mahon was supposed to be travelling ‘on business’. Miss Kaye had set her heart on eloping to South Africa. She had informed her friends that she was engaged—she had shown some of them a ring-and that her fiancé had a good post at the Cape. In a letter written to a friend on April 14 she said that she and ‘Pat’ intended to spend a little time in Paris before going out. This was the last communication that any of her friends or relatives had from her. On Tuesday, April 15, the two travelled to London together. Mahon had agreed to apply for a passport, but when they met in the evening to return to Eastbourne he told her that he had not done so, and did not intend to do so. A quarrel broke out in the train. If Mahon’s story is to be credited the woman presented him with an ultimatum when they reached the bungalow. She insisted that he should write to friends that he intended going to Paris and thence to South Africa. Mahon refused, and Miss Kaye, in an access of ungovernable fury first threw a coal axe at him, and then attacked him with her bare hands. In the struggle—this is Mahon’s version—they fell, and she struck her head on a coal cauldron. A little later he realized that she was dead. I mention Mahon’s explanation, but few people will be found to believe that it was other than a cold-blooded and premeditated murder. Clearly he knew that he would be free the following evening, for he had during the day wired to Miss Duncan making an appointment. His story of consternation and horror has a genuine ring. Mahon was a man of temperament and he felt the reaction. He was face to face with the problem that has confronted many murderers—the disposal of the body. And although he seems to have formed his plans beforehand—witness the purchase of the saw and the knife—he had not the nerve to put them into immediate execution. He carried the body to a spare bedroom and covered it with a fur coat. That night he spent in Eastbourne, and on the next evening he dined in London with Miss Duncan. He remarked that he was staying at a charming bungalow and induced her to agree to pay him a visit two days later—on Good Friday. He confirmed this the following day by a wire from Eastbourne, ‘Meet train as arranged, Waller,’ and sent a telegraphic money order for four pounds. Unquestionably Mahon’s nerve was badly shaken and yet to all outward appearance he gave no sign. Miss Duncan does not appear to have had any suspicion and she went down to Eastbourne on Good Friday afternoon and was met by Mahon and taken to the bungalow. That day before her arrival he had commenced a sinister work, and there was one room that was barred to his visitor. He told her that it contained valuable books. The next day he left her at Eastbourne and went by himself to Plumpton Races. Here he was noticed by an acquaintance who attached no special significance to the meeting, although it proved to be of vital importance in the chain of circumstance that was to betray the murderer. Mahon realized by now that the presence of Miss Duncan was going to embarrass him. So he concocted a telegram in a fictitious name and despatched it to himself as Waller at the bungalow, making an appointment in London for an early hour on Tuesday morning. Thus he was afforded an excuse for cutting short Miss Duncan’s stay. They returned to town on Easter Monday, and somewhere about midnight Mahon arrived back at his home at Kew. He was back at the bungalow on Tuesday. Here I may tell a curious story which did not come out in evidence. He had already partly dismembered the body, and he now set to work with the intention of disposing of the remains piecemeal. The day was dark and heavy. He built a huge fire in the room and upon this placed the head. At that moment the storm broke with an appalling crash of thunder and a violent flash of lightning. As the head lay upon the coals the dead eyes opened, and Mahon, in his shirtsleeves as he was, fled blindly out to the rain-swept shingle of the deserted shore. When he nerved himself to return the fire had done its work. It was an extraordinary coincidence that whilst he was giving evidence at his trial a thunderstorm was also raging. He gave calm denial when he was asked if he had desired the death of Miss Kaye. Almost on his words the court was illumined by lightning and re-echoed with the crash of thunder. Those who saw his face and knew the truth will never forget that moment when the sound of the storm brought back to his mind that fearful midnight scene. He was a broken man when he faced the deadly crossexamination of Sir Henry Curtis Bennett. MAHON discovered that with every method his ingenuity could suggest the disposal of the body was likely to be a long job. Meanwhile he had to show himself at his office and his home. He returned to his home on the Tuesday night, and during the rest of the week he had to be at his work. On Saturday and Sunday he renewed his labours. On Sunday he conceived the idea of distributing some pieces of the dismembered body from a railway carriage window. He spent some time over the gruesome business of packing a Gladstone bag. No chance seems to have offered itself on the journey to London that evening but he did succeed in getting rid of some portions between Waterloo Station and Richmond. But he was unable completely to empty the bag, and he decided to go on to Reading. The night he spent at an hotel in that town. The next day—Monday—he returned to London. The bag was now empty save for the wrappings he had used and a cook’s knife. These he probably intended to destroy later. He was acute enough to realize that if he had thrown them away they might have been identified. The bag he left at one of the cloakrooms at Waterloo Station and went home. Now, although Mrs. Mahon had forgiven more than most women would have done, she was a person of intelligence. Mahon’s strange comings and goings of late, his messages by telegram, his stories of business out of town, did not altogether impose on her. She knew him too well. Still, although she could not fail to be suspicious, no glimmer of the real truth was present in her mind. Someone had mentioned casually that he had met Mahon at Plumpton Races and she feared that this was an explanation. Her husband had been previously mixed up with bookmaking and, in spite of his promise to her, it was possible that he had gone back. She found the cloakroom ticket in one of his suits. She took a friend into her confidence—he had been formerly connected with the railway police—and asked him to discover what it referred to. She had a belief that it might be some of the paraphernalia used by bookmakers. Thus it came about that the bag was closely examined. It was locked, but by pulling at the one end some indication of its grim secret was revealed. Scotland Yard was immediately informed, and Chief Detective-Inspector Savage had men posted to watch the cloakroom. Mrs. Mahon was informed that there was nothing to suggest that her husband was bookmaking. Mahon returned for the bag on the Friday evening (May 2). As it was handed to him a detective stopped him. “Rubbish,” "he exclaimed when told that he would be taken to a police station. This little touch of bravado did not help him. He was taken to the station and later to Scotland Yard. The bag was opened and was found to contain a cook’s knife which had been recently used, two pieces of silk, a towel, a silk scarf, a pair of torn knickers, and a brown canvas racquet case marked EBK. Most of these things were blood-stained, and the whole contents of the bag had been heavily sprinkled with a disinfectant. Savage confronted his prisoner with these things and asked for an explanation. Mahon explained, lamely, that he had carried meat for the dogs in the bag. “You seem to know all about it,” retorted Mahon. He was cautioned, and then he told for the first time his version of the tragedy. I have drawn upon this and his subsequent statements in this account of the affair. The Scotland Yard experts and the East Sussex Constabulary at once got to work. A search of the bungalow revealed many traces of the crime. There were portions of the body, and evidence of the attempt to get rid of it. But two very important parts of the body were missing. No trace of the head could be found. This, in all probability would have shown exactly how the murder was committed. There was no trace of the uterus. THE trial opened at Lewes Assizes during July, 1924, before Mr. Justice Avory, an experienced and strong criminal judge. Sir Henry Curtis Bennett led for the Crown, and Mr. J. D. Cassels, K.C., for the defence. The point taken by the defence was that the death of Miss Kaye was an accident, that either during a struggle between Mahon and Miss Kaye she had died from striking her head against a coal-scuttle, or that in fighting her off he had unintentionally strangled her. Mr. Cassels handled the case with notable skill, but he had to fight some deadly and almost irresistible inferences. Although Sir Bernard Spilsbury, the pathologist, refused to commit himself to an opinion on the precise manner of death he was definite in his assertion that it could not have been caused by the woman striking her head against the coal-scuttle, which was of fragile construction. He was able to say that Miss Kaye, had she lived, would have become a mother. All the shifts and deceits of Mahon during his intrigue with Miss Kaye were exposed to the jury. It was shown that over £500 of Miss Kaye’s savings had disappeared. Three one- hundred pound notes, which had been in her possession, were shown to have been changed by Mahon in false names at various places. Overwhelming motives were shown by which he might have been actuated to murder. The judge’s charge to the jury was a lucid, perfectly fair, but damning summary of the case. Within half an hour the jury had found Mahon guilty. You may say, as has been said, that none but a lunatic could have acted as he did; but apart from the deed, Mahon acted like a sane, calculating man. I have referred to Mahon’s vanity: it is a peculiar trait in all the ‘great’ murderers that they desire to be thought well of. He cannot bear the thought of leaving a stunned servant maid with a bad opinion (not unnatural) of the man who assaulted her. He is at all times anxious to be considered by his respectable companions as a man of substance and a prince of good fellows, a self-described ‘Broth of a bhoy’. There was never a more cold-blooded murderer except perhaps George Joseph Smith, than this unspeakable villain. Even at the end, when he confessed his guilt to the prison officials, he begged that they would not make public his confession for fear of the ‘bad impression it might make’.